Description: Color postcard of two women sewing tobacco leaves by hand. Pairs of leaves are sewn to a string attached to a wooden lath. The laths are hung between rafters in large tobacco sheds where the leaves cure. 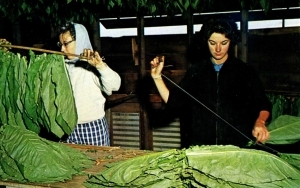 Large shade grown tobacco leaves from the Connecticut River Valley are used for cigar wrappers.